Crowning the Hall of Memory is a domed ceiling covered in tiny golden stars. 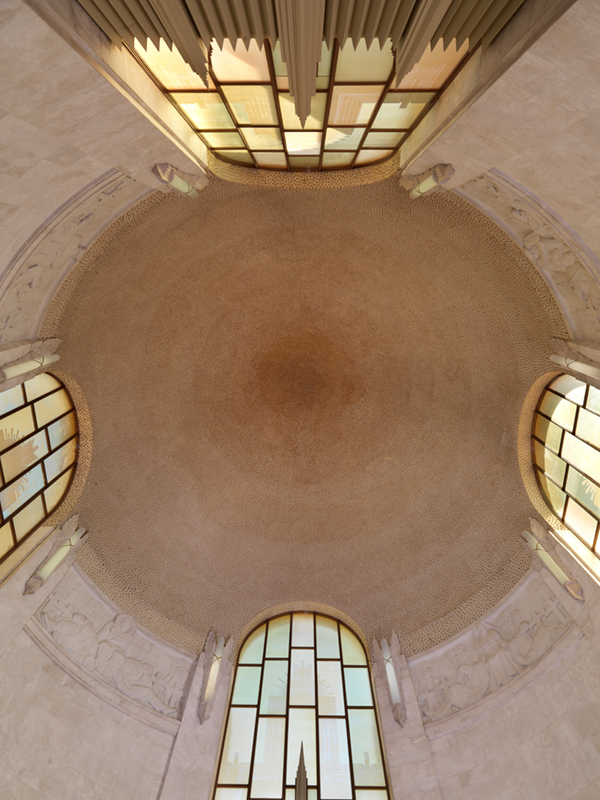 The ceiling of the Hall of Memory is 26 metres high. It is covered with 120,000 stars. The stars are a symbolic representation of the men and women from New South Wales who embarked for overseas service during the Great War. When funds for the construction of the Anzac Memorial began to dry up the Trustees accepted a proposal that members of the public could purchase a star for 2 shillings (2/-), a significant donation during a time of austerity, and the money would go into the building fund. While not all of the stars were sold a sufficient amount of money was raised by the scheme to enable the completion of the Anzac Memorial. In fact over 130,000 men and women from New South Wales served in the Australian Imperial Force. The state also contributed men to the Royal Australian Navy and a significant number of people from the state served in other armies and navies of the British Empire during the war.